Created in 1964, the Park Of The Europe can be considered as a park and as a public garden. In 1992, its surface was extended from 9 to 11 hectares. Near the Rond-Point, in the south of Saint Etienne, the park is appreciated for its walks, its mini-train, its roundabout, its several children's playgrounds, its fountain and its skate park. 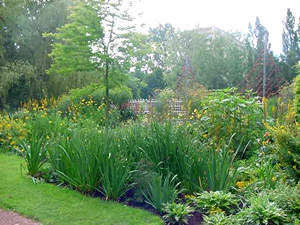 There is also in the Parc de l'Europe a tour of perennial gardens particularly interesting for its arrangement and botanical attraction. number 18 to Le Marais (Parc de l'Europe stop).